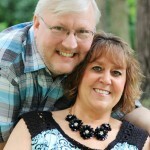 You are here: Home / Expressions of Hope / How Can I Trust God Again? 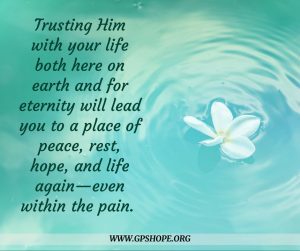 Those of us who have lost a child can have major struggles with trusting God. We may have prayed daily for God’s protection over our children, trusting that He will answer that prayer because of our unwavering faithfulness. We may have fasted and prayed for a sick child, fully believing we will see Jehovah Rapha, God our Healer, in action. People around us may have told us something like, “Keep praying in faith. God is going to heal your child,” which brought encouragement at the time. 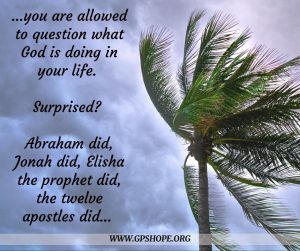 First, let me say that you are allowed to question what God is doing in your life. Surprised? 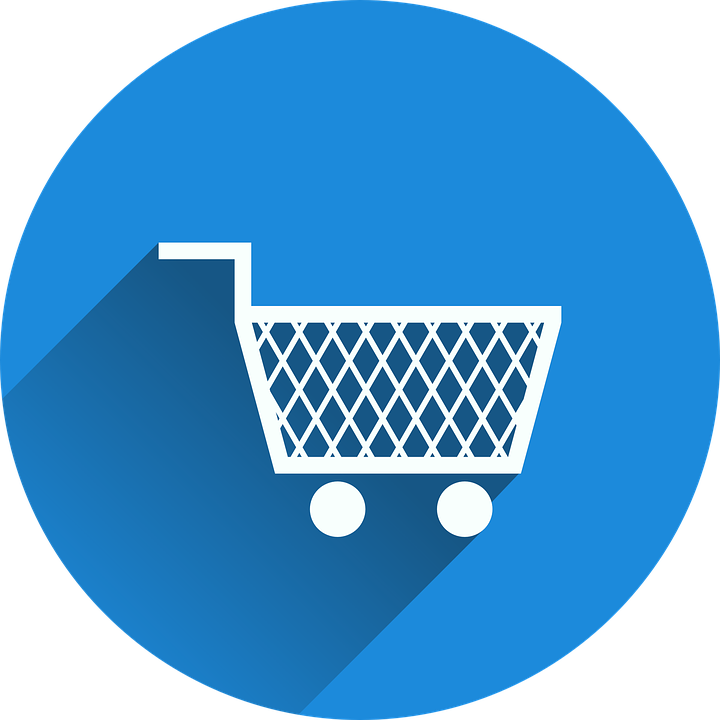 Abraham did, Jonah did, Elisha the prophet did, the twelve apostles did… get the picture? We have prayed for protection or healing for our children, and that prayer was not answered. When my daughter, Becca, was three and was diagnosed with cancer, I believed the more people I told that God was going to heal her, the more He was obligated to do so, based on how much faith I had. I was shocked when she had her tiny left leg amputated (due to cancer in the bone) and went through nine months of chemo. My shattered faith sent me on a journey to discover what this faith stuff was all about. I learned over the years that faith isn’t getting the answer I want to the prayers I am praying. 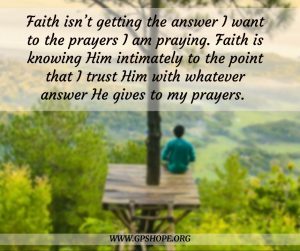 Faith is knowing Him intimately to the point that I trust Him with whatever answer He gives to my prayers. I saw this in action seventeen years later. Becca had an extremely high-risk pregnancy (due to heart damage caused by the chemo) with a 50/50 chance of surviving the labor and delivery. As they were wheeling her away to start the process, I found myself crying in my husband, Dave’s, arms. I told him I didn’t understand why I was crying, because I knew in my heart I trusted God with both Becca and the child she was carrying. God so very graciously spared Becca’s life at that time, and the life of our first grandchild (who is now 15 years old). However, nine years later, too sick to even be put on the heart transplant list, our daughter’s heart gave out, and she left this earth on October 12, 2011 at age 29. Yes, it sent me into a suffocating darkness I didn’t even know existed. But trusting God and refusing to let go of Him in the midst of my pain, which was so deep I would sometimes forget to breathe, is what got me where I am today. It reminds me of when Jesus asked his disciples if they were going to leave him like the rest of the crowd did, when He said something difficult that made no sense to them whatsoever. Peter’s response was, “Where else would we go? 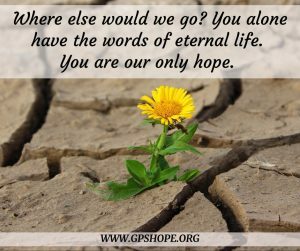 You have the words of eternal life” (John 6:68). One thing I have done to help build that trust in God through this, is to slowly shift my thinking to Becca’s gain instead of my loss. For instance, I don’t like it when other people tell me, “But she is healed now!” Duh! I know that, but that wasn’t what I meant when I was praying for her, and I still want her here with me! Telling me that doesn’t “fix me” or make me feel better. But when I am by myself, and allowing the Holy Spirit to be my Comforter, I can start to receive that truth. She really is healed now, dancing with both legs, has no more trouble breathing and has a strong heart that will never give out again. She is done going through the painful trials and traumas of this world. She is safe. She is whole in body, soul and spirit. And I believe she is waiting for me with great anticipation. I can even thank God that my daughter is safe, and whole, and happy! Am I totally healed and back to “normal?” No way! That will never happen. But I am leaning on God in this painful journey, and it is not based on what I can see or know, but the exact opposite. It is based on what I cannot see and what I do not know, because that’s what trust is. In other words, I have learned that choosing to continue to trust God here on earth with temporary painful things I don’t understand gives me so much more peace than choosing to remain angry and being determined He is not trustworthy. Trusting God again doesn’t usually happen in just one decision, but in making the decision over and over again. It can be a process, and that is okay. I encourage you to choose to make that decision as often as you need to, so that God can wrap you in His hope, His comfort, and yes, even His peace. Ask Him to help you shift your perspective to see things in a different way. Allow Him to give you the strength to trade the anger and blame, so you can receive the love of the Father that your child is now basking in. Think about it. Our children now know how trustworthy He is because they can see the full picture that we cannot see! Yes, God has everything you and I need to help guide us out of the darkness of our suffocating grief. You can choose to trust Him in the midst of the pain. And I’ll bet your son or daughter would tell you the same thing. Would you like a simple tool to help with anger? The award winning “My Grief Journey: A Coloring Book and Journal for Grieving Parents” has two pages on that subject. If you would like to receive them, just submit your information below. Thank you for writing this one. When my daughter first died, I was extremely angry with God. I told Him so too, many times. I didn’t trust Him. I had stood on the verses that said if you believe, it will be done. I also skipped over verses that had anything to do with asking God for (fill in the blank), or God will take care of you etc. My thoughts were always a flat, no He won’t!! I’ve come a long way in almost five months. I still read verses and cringe. I still have trust issues. But. . . it’s getting better. Nancy, five months is such a short amount of time for sure. Remember to gve yourself lots of grace! And just to let you know, it has been almost 7 years for me and some verses I still have a hard time with… but there are others that I have such a new view of that are now treasures like they have never been before. Hugs!